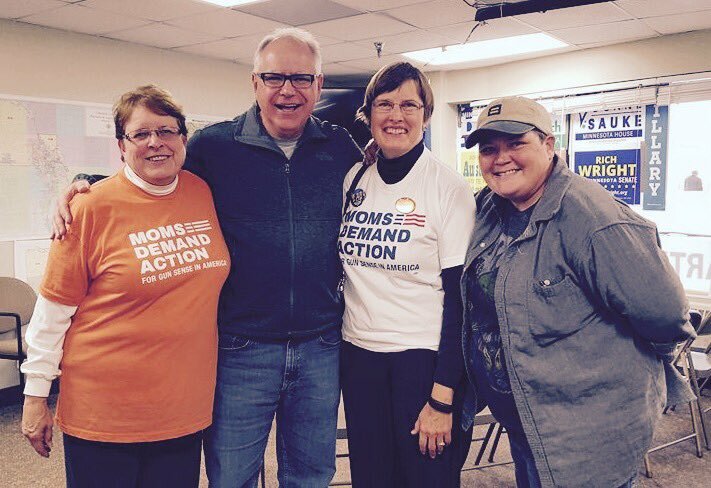 Rep. Tim Walz like to portray himself as a pro-Second-Amendment legislator. But here the Representative is, huddled up with some of Michael Bloomberg’s paid shills, promising to support larding up law-abiding gun owners with additional regulations, and to carry the Bloomberg agenda (which, make no mistake, leads inevitably to New York-style gun control. When it comes to supporting the human right of self-defense, he talks the talk every two years. But actions – especially the dimwitted ones that Bloomberg’s “Moms” demand – speak louder. This entry was posted in Campaign '16 and tagged MN CD1 by Mitch Berg. Bookmark the permalink. If your horizon ends at the next cornfield, you may become a useful idiot on the net. And people wonder why the Democrats are nearly extinct in rural America. That is really heinous. Everyone needs to see that photo. If you have friends in MNCD1, share it profusely. Are the people in the pics the overweight, middle aged white people Dog Gone is always complaining about? Is Walz a white-supremacist? There are no people of color or indeterminate gender in the photo.